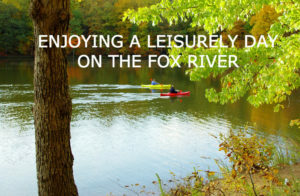 Located up in Lake County, northwest of Chicago, the Fox River cuts a pretty path, passing through small and larger towns and providing a wealth of fun for all ages. One of the best ways to enjoy it is leisurely paddling down it in a canoe. Plan to stay at the Victorian Rose Garden Bed & Breakfast in Algonquin, and you’ll have a good base for exploring the Fox River and area. The waters of the Upper Fox River, a section below Chain O’Lakes State Park, can be quite busy with motorboats, so your best bet for canoeing is down river. Head below the McHenry Dam, and you’ll find nice stretches with tree-lined banks, that are suitable for everyday paddlers. As you come to the Middle Fox area, the river passes through busy towns—Elgin, St. Charles, Geneva, Batavia, and Aurora—and crosses over several dams. However, in between these hubs, the river offers leisurely going and pretty views with woods and forest preserves lining the water. The Lower Fox is the prettiest of all, and ideal for a quiet day on the river. A particularly lovely area is the stretch between Yorkville and Wedron, where you’ll glide by stunning rock cliffs and around several small islands. Keep an eye out for waterfowl—herons frequent the Fox River—and even the occasional otter. If you’d like to try a guided river trip, you can do so with Fox River Canoe & Kayak which runs trips out of Batavia, St. Charles, and North Aurora. Another option is C&M Canoe Rental in Wedron, Illinois. Give them a two-week notice and the company will supply everything you need—17-foot canoe, paddles, life jackets, and transportation to one of two locations along the Fox River. Stay at the Victorian Rose Garden Bed & Breakfast and you’ll not only enjoy a hearty homemade breakfast before you head out for the day, but will be welcomed home with homemade goodies on the kitchen counter and a supply of complimentary beverages in the fridge. The quaint B&B, which has four en-suite rooms, is located in Algonquin’s historic downtown, convenient to restaurants and shopping. Victorian Rose Garden Bed & Breakfast is a member of the Illinois Bed and Breakfast Association and offer a unique lodging experience! 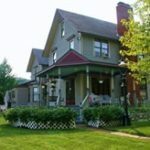 This entry was posted in Illinois Bed and Breakfasts, Outdoor activities and tagged Illinois Bed & Breakfasts, outdoor activities, Summer activities by admin. Bookmark the permalink.